Nestle Quality Assurance, based in Dublin, OH, is seeking spring interns in microbiology and chemistry. The start date for the internships is Jan. 15, with interns working about 20 hours a week for 12 weeks. Weekend shifts are available. Apply now at the internship links below. The posting also are in Bobcat CareerLink. “Nestlé has elevated its commitment to quality and safety with a $31 million investment in the Nestlé Quality Assurance Center (NQAC) in Dublin, Ohio, which was designed to raise the bar for the verification of food safety and quality standards and provide support for the implementation and maintenance of food safety programs. As a global leader in nutrition, health and wellness, Nestlé has invested in advanced food safety systems and the development of a world-class network of quality and safety experts and laboratories. NQAC Dublin is now the largest and most sophisticated testing facility in the Nestlé network and possibly the world,” according to a 2016 Nestle announcement. 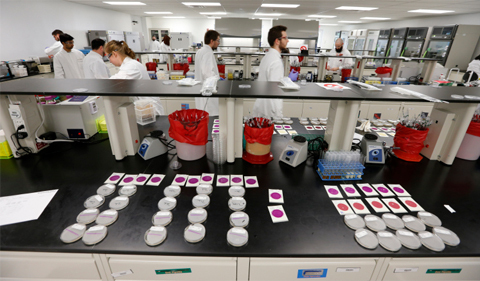 Microbiology Internship: “The Nestlé Quality Assurance Center in Dublin, OH is seeking Microbiology Interns for a three month, part-time, paid spring internship in our Microbiology Laboratory. Position responsibilities include sample preparation, sample weighing, and sample processing within one of our Microbiology Laboratories. Position responsibilities also may include routine analytical work, lab sanitization, preparation of media, disposal of media, sanitation of containers, loading of autoclaves, supply inventory & retrieval, sample rotation, work documentation, and sample log-in. Other duties may be assigned as required,” according to the internship posting on the Nestle website. Chemistry Internship: “The Nestlé Quality Assurance Center in Dublin, OH is seeking a Chemistry Intern for a three month, part-time, paid spring internship in our Chemistry Laboratory. The Chemistry Intern will be responsible for conducting testing for juice authenticity and nutritional labeling. Responsibilities include sample preparations, extractions, good lab practices (including thorough documentation and following safety protocols), and other duties as assigned,” according to the internship posting on the Nestle website.